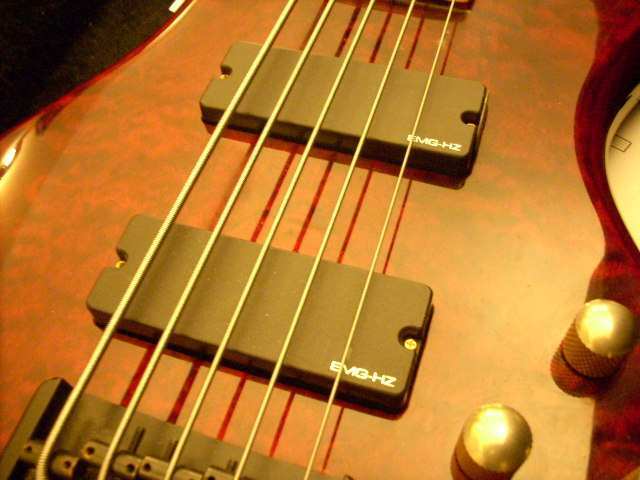 The photo above is just one example of many types of pickups for bass guitars. The ones above are an active Jazz Bass set made by EMG. Active pickups have a small built-in amplifier inside the pickup housing. They also require a battery (usually 9 volt) to operate. The other common type of electro-magnetic coil pickup is the passive type. There are number of variations on pickup wiring, which you should be aware of too. Check here for series wiring for pickups. The passive type is very common. It is the pickup found on the Fender Precision Bass, Fender Jazz Bass, and many other common basses. There is no battery needed for this type of sensing coil, as it produces its own voltage signal from the pickup itself. The Precision Bass pickup is what is called a split coil type. The purpose here is to reduce external noise (i.e. hum from stage lights, radio stations, lightning, etc.) to the sensor and only produce the sound of the strings. Below is a photo image of a vintage Fender P-Bass pick on my Warmoth Fretless Bass. The above pickup are a split coil design that can be wired to be hum canceling. However, since I have it coupled with a Jazz bridge pickup, I have them wired as a single-coil type. 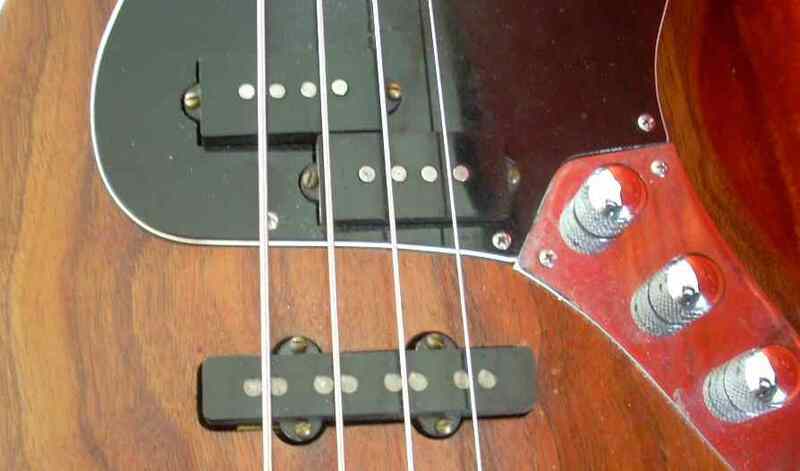 If you wire the P-bass pickup, on a bass like this, as hum-canceling, in connection with a single coil Jazz bass pickup, the result will be that two of the four strings will be out of phase. 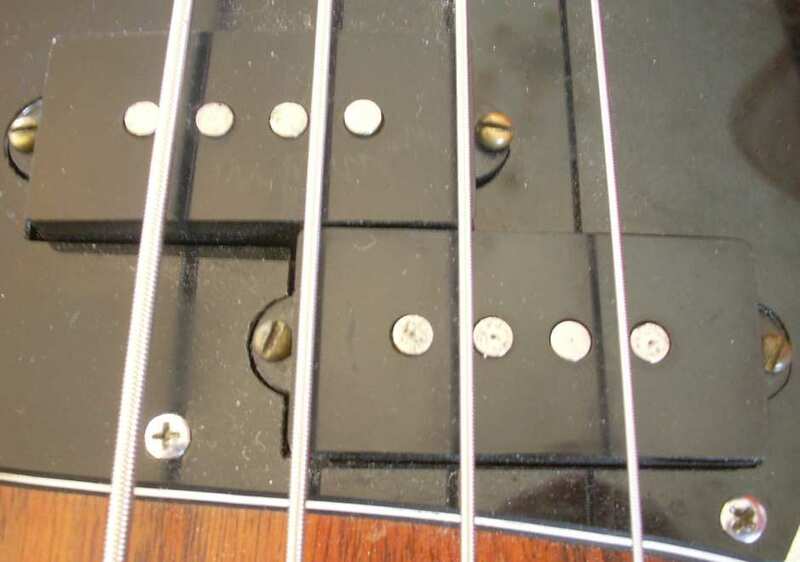 Below is the P-J configuration on my fretless bass. For wiring this type of pickup group see the pickup_PJ_wiring page. The bridge pickup is a Seymour Duncan Quarter Pounder Jazz Bass type. This is a popular set up on basses, since it gives you the low-end clarity needed in many situations. 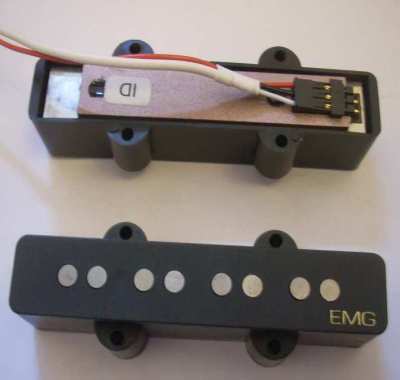 Below are a set of EMG Active Soapbar Pickups, as found on my Schecter bass. These are a High Impedance (Hi-Z) type active pickup. These are a special pickup designed for only a few different basses. These types are usually hum-bucking too. I have never heard any electrical buzz from this bass. The active circuit is very clean with very little hiss. One of my favorites in bass pickups are the ones manufactured by Bartolini (see http://www.bartolini.net). The electronics that go with their active pickups are very well designed, and has the bass player in mind. The roll off points for the On-Board-EQ is well thought out. They have been in business for years, and their pickups are put in some of the best basses out there, including: Modulus, Tobias & MTD, Lakeland, Zon, Pedulla, and others.